Home › Pro Wrestling › Is it time to Reboot the WWE? Is it time to Reboot the WWE? WWE Television is currently a stale product. Professional wrestling always has its down time before another boom period arrives. In order for the boom to take place, however, a new star needs to emerge. This person needs to be a bonafide superstar the caliber of Hulk Hogan, Stone Cold Steve Austin, and The Rock. Simply being a wrestling star such as John Cena, CM Punk, and Randy Orton will not move the needle in the required direction. When this boom period finally occurs, it’s usually a wrestler who was waiting in the wings for their big break. These days, Dolph Ziggler is the usual suspect. He is a good worker but can he be the box office smash that brings the business to Attitude Era heights? On October 1, 2012, Monday Night Raw drew its lowest rating in 15 years. The company improved its rating by having its 67-year-old chairman wrestle the WWE champion. While it was certainly an attention grabber, it was only a short-term solution since Vince can’t wrestle every week. While Raw moving back to two hours would be a move in the right direction, it doesn’t address the larger problem at hand. The process of booking by committee dilutes what storylines ultimately end up on television. If the big three can’t do any more than they already have and there is no legitimate heir apparent on the horizon; what else can be done? This idea will probably light up the comment section but maybe, and I stress, maybe, it’s time to reboot the WWE. Rebooting an entertainment franchise means completely starting from scratch and ignoring everything that occurred in the past. This means Hulk-A-Mania, Montreal Incident, The Streak, ECW, The Four Horsemen, Steamboat vs. Savage and the legendary careers of Lou Thez, Bruno Sammartino, and Ric Flair never happened. Anything and everything would be erased. This would be a big pill to swallow. Pretending the grandeur of the past was just a dream could make the process of creating new stars easier because you would be free from the restraints of continuity and it would mean a fresh start for everyone on the roster. Some wrestlers could change their look, while others can completely change their character, attire, and name. Wade Barrett could go from bare-knuckle brawler to Wall street sleaze and Rey Mysterio can go from masked luchador to unmasked Dungeons and Dragons wizard, Rey Merlin. Subtle changes can be made as well, such as turning Randy Orton heel and importing new talent from Florida and beyond to give the reboot that new car smell. Changing the name of the TV shows and pay-per-view events could also be done, or at least change their look, feel and presentation. WrestleMania could be in July instead of April and who says WrestleMania needs to be the premiere event anymore? Money in the Bank could now be the granddaddy of them all. 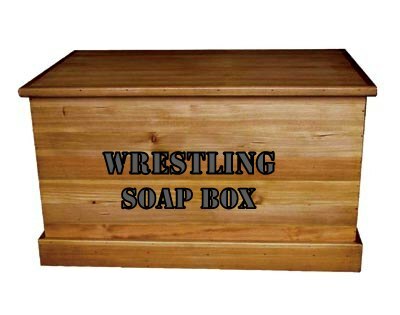 Create a new event or dust off names from the past such as No Mercy or Starrcade. If you want to tweak the reboot, leaving some things the same can also work. DC Comics rebooted their entire universe last year by renumbering all of their books to issue one. Their universe is now only five years old. Everyone got a fresh coat of paint and new or revised origin stories. Superman & Lois Lane were never a couple, Aquaman is cool again and Batman and Green Lantern were the only characters whose continuity was completely left intact. Superman’s first appearance was not in the first issue of Action Comics from back in 1938. It was in the 2011 inaugural issue of Justice League. If the WWE were to follow this model or something similar, equivalent examples could be such as their universe is only three years old while John Cena and CM Punk’s continuity could be left alone. Dolph Ziggler and Vickie were never a couple, Sin Cara is over like gangbusters and Hulk Hogan never slammed Andre the Giant in front of 93,000 people. While comparing WWE and DC Comics may be lost on some people, professional wrestling is really a live action comic book so the comparison is valid. DC’s reboot led to record business and they have consistently sold the majority of the top ten monthly comics for a year now. The WWE needs to do something to make wrestling exciting to the masses again. A reboot may or may not be the answer but whatever they do, it needs to be something outside the box and it has to be done with precision planning and unfaltering faith in whoever they give the ball to.